Our behaviour modification program was developed to help people who are struggling with their dog's behaviour as the primary issue. We can help with a wide variety of canine behaviour and the focus of this program is to assess the function of the problematic behaviour which will help us understand why it is happening and thereby how to effectively imprint alternative behaviours and/or counter-condition or modify your dog's reaction to stimuli (ex. a dog's reaction to other dogs, people, certain environments). Other behaviours such as excessive barking, digging, running away, and hyperactivity. This program is similar to the private training program as it includes 5 private training sessions 1-to-1 with your trainer who will come to your house to assess the behaviour and environment in which the issues occur, and then develop a plan to address the concerns throughout the remaining sessions. Your trainer will leave you with techniques to practice to continue working towards your goals in between training sessions. 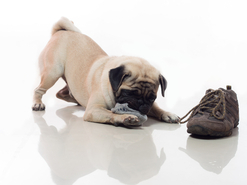 If you are unsure if the behaviour modification program is the best fit for you, contact us and we can discuss the different programs available and help you determine which program best suits the needs of your dog and the goals you have for dog training. We have developed our behaviour modification program to include 5 training sessions as we find this number is ideal to assess and work through modifying problematic behaviours, however, sometimes people like to start with a single session or feel they only need a single session to help with their situation.